Alpine Recreation - Lake Tekapo. 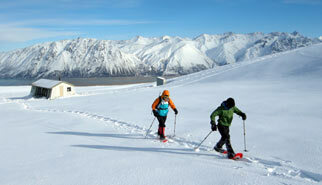 Activites with Tekapo Tourism. The foothills of the Southern Alps undergo a magic transformation in winter. A covering of snow turns these tawny tussock lands into an extensive playground, not just for skiers, but also trampers on snowshoes. Hike 3 hours up to our cosy mountain hut at the snowline (1280m) and use this as a base to explore a winter wonderland of ice-covered streams, curving ridges and snowy valleys. Relax in the evenings in the warmth of a pot belly stove. Maybe try a Glühwein and fondue in true Swiss style. 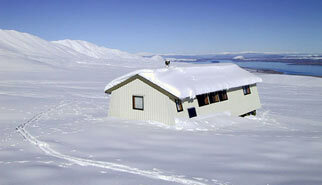 The more adventurous can choose to build a snowcave and sleep in it - or retreat to the hut! Here in the foothills of the Southern Alps you are in the newly created Kahui Kaupeka Conservation Park of the Two Thumb Range with grand views across the Mackenzie Basin and of the major peaks of the Main Divide, Mounts Cook and Tasman. We recommend 3 days as an optimum time for sampling snowshoeing, but for those limited to weekends 2 days will certainly give a refreshing break; and there are plenty of trail options for those who are able to spend 5 days. The Two Thumb Range forms the eastern boundary of the Mackenzie Basin, close enough to the Southern Alps to get great views, but sheltered enough to escape many of the predominant north-west storms hitting the Main Divide. Gottlieb Braun-Elwert, founder of Alpine Recreation, pioneered ski touring in the Two Thumb Range in the early 1980’s. The high country above Lake Tekapo ticked all the boxes: a good variety of terrain, a series of parallel valleys to allow different tours for at least five days, a choice of alternatives for marginal weather and avalanche conditions, and easy foot access (3 hours from the road-end to Rex Simpson Hut). 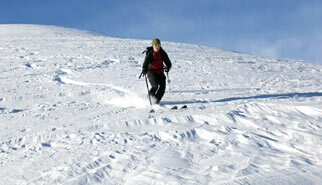 Add to this a cosy hut and you have the recipe for a great backcountry holiday! Hike above worry level in the foothills of the Southern Alps. Be inspired by the magic light of the Mackenzie High Country across golden tussock, snow-capped peaks and the turquoise of Lake Tekapo. Climb a 2070m peak and return to a cosy mountain hut to savour the sun setting behind mountain silhouettes and a star-studded sky - one of the clearest and darkest skies in the southern hemisphere. The Tekapo Trek is in the newly created Te Kahui Kaupeka Conservation Park, which encompasses the spectacular landscapes of ice-steepened mountains and broad glaciated valleys of the Two Thumb Range.